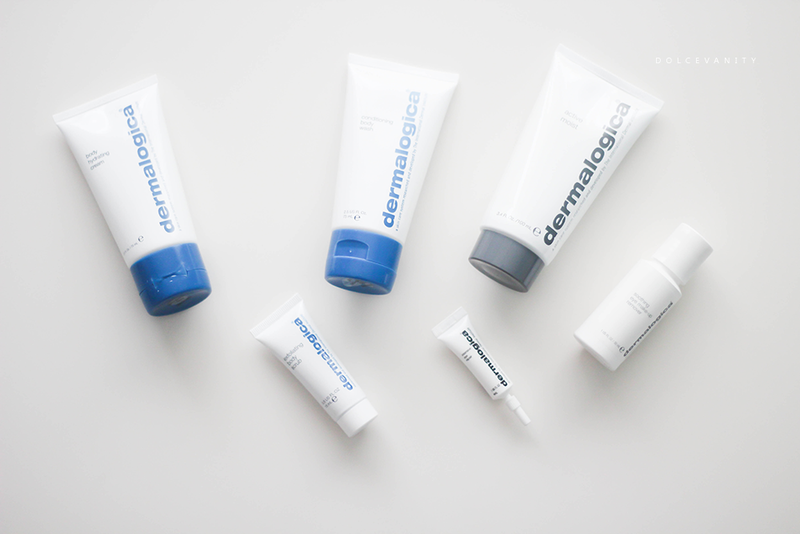 Dermalogica are releasing Limited Edition Gift Sets and I've got two to share with you. I was trained using Dermalogica skincare and I continue to use some bits here and there, one being is the Active Moist which I keep in my kit and I also use Daily Microfoliant when at times. Here's why I love gift sets, if you want to try a selection for yourself or to gift to someone to do the same, it's less expensive and instead of getting a full sized bundle that might not agree with you or whatever reason, it's better to sample and get a selection, right? This rich, soap-free cleanse is acid balanced and infused with purifying essential oils to prevent over-drying. Skin emerges smooth, soft and refreshingly clean. This gives a generous lather and when used on my honeycomb sponge lasts throughout, I'd stopped in September using bubble baths due to my skin feeling very dried out. I've used this a few times over the weekend and my skins not been irritated and it gives a good clean. Lactic and hydroxy acids in this advance moisturiser immediately smooth and condition skin while essential plant oils soothe and soften. Indeed this has a soothing scent in the form of Lavender, Lemon, Apple, Orange, Sandalwood, Clary, Tea Tree, Rosemary. I definitely smell the Lemon and possibly Clary in this cream. It's not greasy and absorbs into the skin easily. Calming Green Tea, Chamomile with the Tea Tree and Lavender act to soften and soothe the skin. This creamy, light-foaming body scrub exfoliates to dramatically smooth without damaging skin. Kind of reminds me of the texture of an oat scrub, I used this little bubba on my knees and elbows with an exfoliating glove. It's gentle and has small grits that don't irritate but give a good exfoliation - exfoliating my favourite time. This set is suitable for all skin types. Formulated without artificial fragrances and colours. Light, oil-free moisturiser helps combat surface dehydration without leaving a greasy after-feel. Apply to face and neck with light, upward strokes. I have this cream, in tubes and in sample sizes, I used this during the Summer on a job to stop any additional oil and skin is quick to get dehydrated especially when combination. I use it on myself as my t-zone can be a pain in the A.
Oil-free, conditioning gel quickly dissolves makeup (even stubborn mascara) without irritating eyes. Apply to wet cotton and gently massage over the eye area. Rinse thoroughly. I'm looking forward to using this, removing eye make-up is a sensitive job, you don't want to be harsh and tug around your eyes when removing make-up so anything that can take off the most stubborn items without damaging is ideal. Antioxidant-rich eye treatment helps replenish moisture, diminish fine lines and repair damage. Gently pat around eye area, working inward from outer corner. May be worn day or night. I'm not sure if I'm imaging fine lines that are already there or I'm dreading my eyes telling stories. There's ways to combat wrinkles (I'll show you soon) but keeping your eye area cool and hydrated is important. The eyes tell all. This set is suitable for skin with excess oil production. Formulated without artificial fragrances and colours. Hopefully this helped just a bit more for gifts this Christmas!